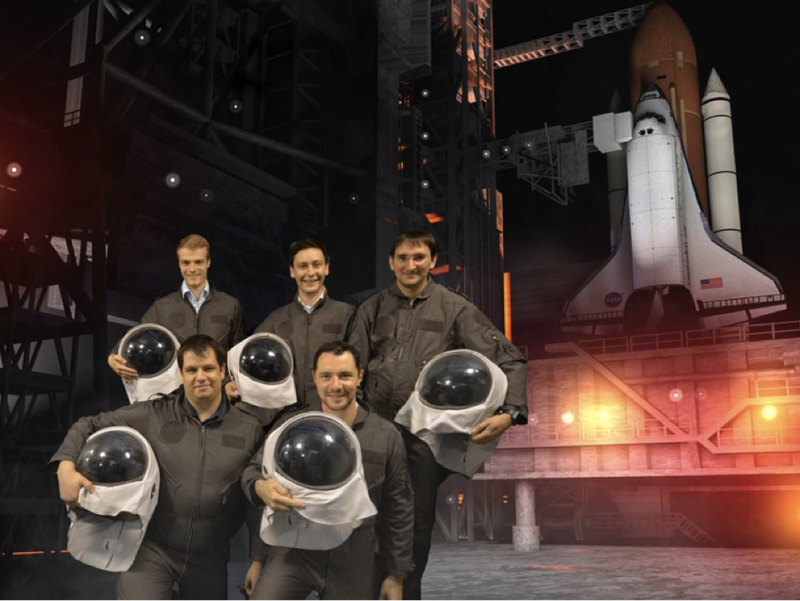 Winning teams from the 2014 International Space Apps Challenge traveled to the Kennedy Space Center to witness the historic test launch of the Orion spacecraft, which will carry humans to Mars. In addition to the Global Winners – Android Base Station, Best Use of Hardware; Aurora Wearables, Best Mission Concept; SkyWatch, Best Use of Data; SkySnapper, Galactic Impact; Yorb.it, Most Inspiring; and Next Vision (Space Helmet), People’s Choice – local winners from the Kennedy Space Center event joined us for launch. What a thrill and honor to have our Space Apps teams travel (at their own expense) to NASA to join us in such a momentous milestone. In addition to our Kansas City guests, team members traveled from Canada, Europe, and as far as India. NASA’s Chief Technology Officer for IT, Deborah Diaz, headed the delegation of Space Apps winners and guests over the course of three days. Caley Burke, Kennedy Space Center local lead for Space Apps, served as our generous host and arranged for our Space Apps team social on L-1. Thanks Caley for making everything run so smoothly. Space Apps teams had the opportunity to visit the Visitor Center before and after the Orion launch. 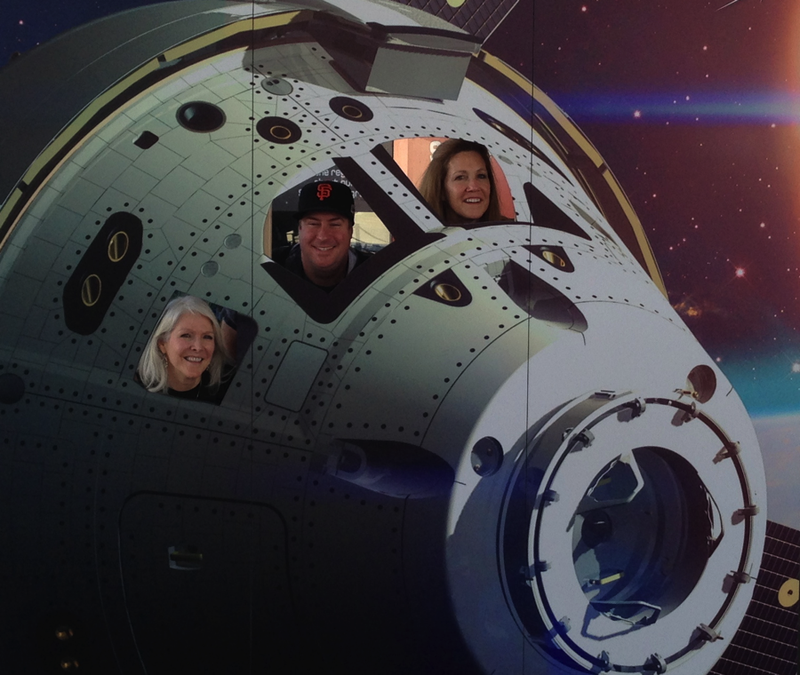 We couldn’t resist a Team NASA ride in the Orion spacecraft (at least in a grounded version of Orion). 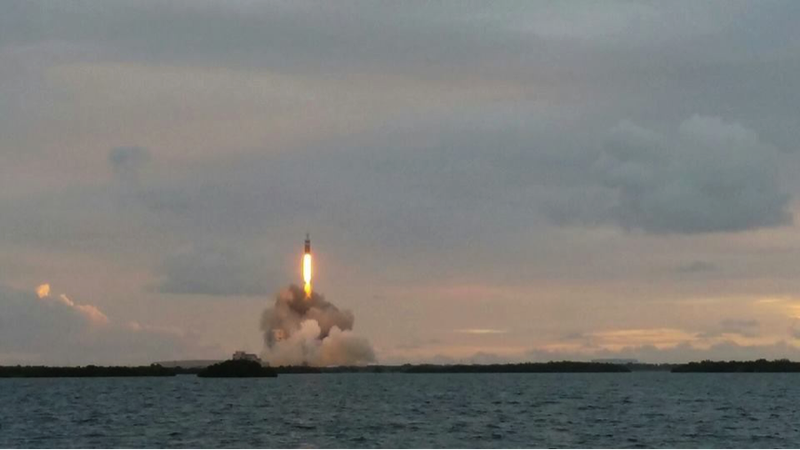 As a NASA employee, I was just as excited to see this launch as our guests. The Orion test flight is the first human-rated spacecraft to leave low-Earth orbit since Apollo 17, the last NASA moon landing. Though no humans were onboard, the spacecraft is rigged with 15 miles of wiring and 1,200 sensors to help us understand what humans will encounter in orbit and upon re-entry to Earth’s atmosphere. The sensors gauge radiation levels and heat shielding at the high radiation zones of the Van Allen belt. First order of business: get Orion off the ground. Not an easy task, as we learned on launch day 1. We began the day with high expectations – only to be dashed when an unauthorized boat strayed into protected zone in the Atlantic, causing a range hazard. 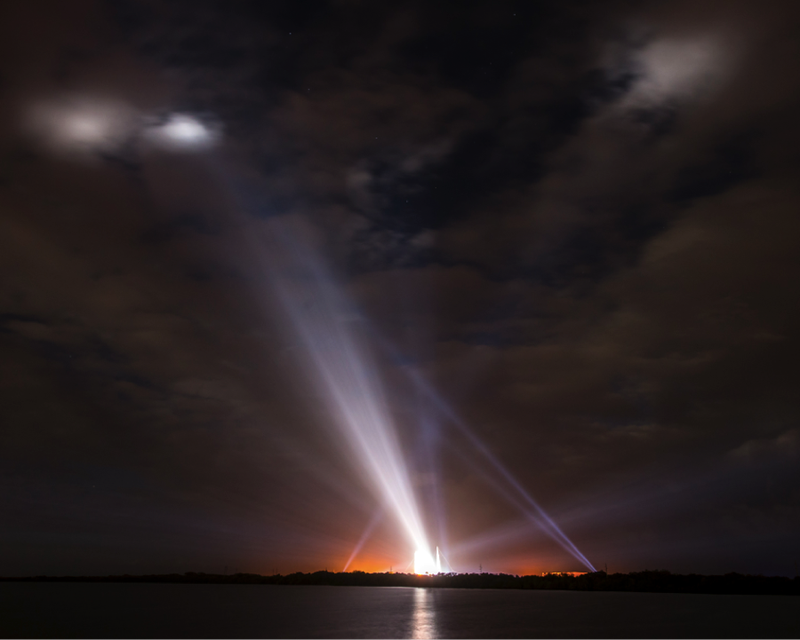 Winds prevented subsequent attempts, until the fill and drain valves on the Delta IV Heavy rocket froze after sitting on the pad during the weather delays. The launch teams tested the valves for a period of time to gain confidence they would close properly. 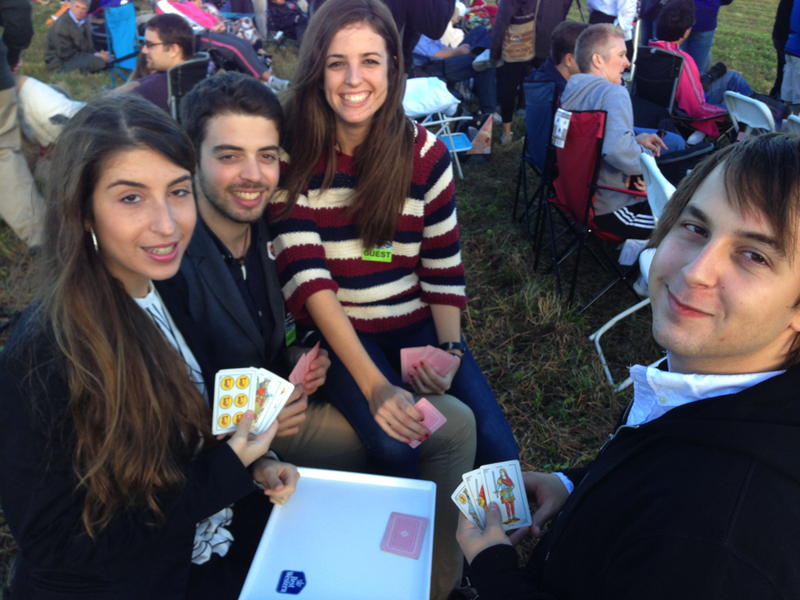 Team Space Helmet passed the time playing cards. Alas, we scrubbed for the day. What a let down. But not to worry, Team SkySnapper suited up for the job – just in case NASA needed help ensuring a successful launch attempt day 2. For two days, we met at the bus pickup site at 3:30 am to make our way to the launch viewing site well in advance of the launch window. On Day 2, the skies opened up to torrential downpours in Cocoa Beach. We fully intended to wade through mud at the viewing area, but amazingly, it was dry. The rain stayed behind us, and Orion lifted off Earth on time – in a blaze of glory! What a tremendous experience to spend time with our Space Apps winners WHILE we made history –on our journey to send humans to Mars. Thanks to the teams who joined us! We look forward to engaging with all of you again in a few months when we kick off Space Apps 2015 in April. For those interested in hosting a Space Apps event in your community, you can apply now.